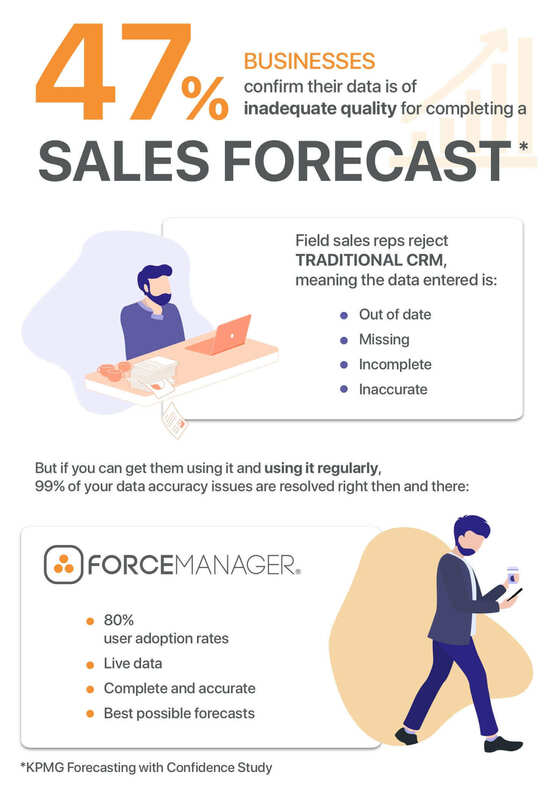 Now that we’ve established the importance of sales forecasting for field sales teams, followed some the key processes step by step and even elected a time-proven forecasting model, our predictions should consistently come in with a low margin of error, right? So why aren’t they? What is wrong? What have we not considered? It doesn’t matter which quantitative method you use: simple moving average, run rate, linear extensions, regression averages or even the extremely efficient, highly recommended exponential smoothing. They’re all completely dependant on accurate data to work. It’s the same concept as in motor racing. Put a set of standard continentals on the car and fill it up with regular gas, you’ll get around the track in a standard time. Fill that same car with premium gas and slip on a set of F1 Pirelli and it’s a completely different story – you get out of it, what you put in to it. Likewise, you could use the most advanced sales forecasting technology on the market, but if the information you are feeding your CRM is incomplete, out-of-date or just down right wrong, then the forecasts produced are going to be wrong too. Quality data collection is notoriously difficult to achieve in field sales. Field sales reps are constantly on the move; starting the day off with a client at one end of their territory, driving to drop off a product to another before coming all the way back to take a product order from another. Now in between all these sales visits and hours spent behind the wheel; when is the sales rep, realistically, able to update their CRM? At the end of the day? Middle of the week? On Friday afternoon after they’ve completed their sales calls? Out of date – If the information is entered a week after the visit happened, what use is that to a manager looking to make an accurate, real-time forecast? Missing – It’s inevitable that some information gets lost with the passing of time, but this info is needed if a complete forecast is to be made. Incomplete – A rep could forget to update the CRM completely, leaving you totally blind. Inaccurate – Often sales reps “wing it” a little either inventing certain details or conversely, choosing to leave them out. What they need is a tool that records this data automatically with no fuss. They haven’t got time to be faffing around with a clunky, complicated system between calls. They want a mobile tool they can take out, record the key sales data from the meeting and within 10 seconds have it back in their pocket again. You know how hard it is to get your team to warm to a CRM. But if you can get them using it and using it regularly, 99% of your data accuracy issues are resolved right then and there. Then go ahead and have a quick look at a mobile sales tool that gets you results, no strings attached!